Greg Hickman has been well described as one of Australia's quintessential horse trainers. He is a man who genuinely loves horses. He is passionate about winning. He's fanatical about his work and is a man who is truly delighted when his owners want to be intimately involved with what their thoroughbreds are doing and how they are progressing. Born and bred in country New South Wales, Greg notes that he always wanted to train horses, right from the time he was a teenager riding at pony clubs, shows and jamborees. That really was the beginning of, what Australian Turf Monthly has more recently described as, "the rise and rise of Greg Hickman & a thoroughly likable and hard working horseman ... the complete horseman who can do any chore around gallopers". Beginning his true racing career in 1986, Greg, and wife Erika, bought their first filly. Working from stalls at the Boggabri Showgrounds his first professional year saw him train eight winners all of which the couple part owned. It was a 1990 bloodstock trip to America that was to really change the Hickman's lives and set the stage for their present operation. Greg had been working for Colleen Underhill at Quorrobolong, near Cessnock, but several of his fellow travelers to the US urged him to switch from the country to the city, and to refresh an old cliche, the rest is now history. Having been offered a job at Warwick Farm's noted Crown Lodge, by the highly respected Peter Snowden, Greg started his Sydney life as a strapper being later promoted to the role of foreman. Of those early days, Greg notes: "I cannot begin to tell you how much I learned in nine years at Crown Lodge, at first from Vic Thompson Snr, Peter Snowden and later from John Hawkes." Building on this potent experience, in 1996 came the first horse that Greg trained under his new Warwick Farm training license. 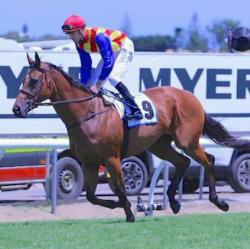 The horse was Perfect Flight who was bought at that year's Sydney Summer Sales. The filly subsequently won 10 races from 1300-2100m, including victories at Warwick Farm, Canterbury and Rosehill and finally in the Wyong Christmas Cup. As a foundation broodmare she produced the multiple city winners He's Canny and Altier. There was early years with Sportsman, an $8,000 yearling who won more than $780,000 and Sir Dex, a $12,000 yearling who chalked up $200,000 in earnings as a two year old and earned more than $830,000. Also there was the $8,000 filly Royal Purler. This horse went on to win the Group 1 AJC Flight Stakes on Epsom Day at Randwick. In 2004 Hickman Racing moved into larger premises at "The Farm's" Manning Street. Starting with just eight horses, the stable today has 25 thoroughbreds. In 2011 came the second Group 1 winner Mirjulisa Lass. A fairytale story for the group of owners who leased this passed in Lot. Looking to the future and many more winners and were our horses are all enjoying the hands on expertise of its passionate and committed trainer and staff.